Are You Tired Of Your Pet's Uncontrollable Shedding? You can now reduce your pet's shedding and never have to deal with pet hair on your clothes, furniture and floors again, thanks to this pet grooming glove! The palm and fingers ofthe pet grooming glove are covered with 259 silicone tips that will remove your pet's loose hair and brush its coat -and the best part? Your pet is actually going to enjoy it! These silicone tips are smooth and soft, so they will brush your pet's fur and massage their skin without hurting them. This Dog Grooming Glove Works For All Breeds And Hair Types! The CAITNAND pet deshedding mitt is the ideal grooming tool for dogs, cats, horses and small animals. Whether your pethas long, short, straight or curly hair, the pet grooming mitt will never fail to remove all the loose ones. The Pet Shedding Glove Will Fit Your Hand Perfectly! This is a one-size-fits-all dog shedding glove and it is designed to perfectly fit the hands of both men and women. In fact, the adjustable wrist strap of the pet hair removal glove will provide you with the most comfortable and secure fit. Try them on and see for yourself! Brush Your Pet's Fur With Ease, Or Your Money Back! In the unlikely case that you're not satisfied with the premium quality and undeniable practicality of this pet grooming mitt, you can ask for a full refund. CAITNAND offers you a 100% money back guarantee, making this a completely risk free purchase, so why wait? Scroll Up And Click The "Add to Cart" Button NOW! IS THERE PET HAIR ALL OVER YOUR HOUSE? This dog grooming glove will remove all the loose hair from your pet's coat, leaving it well-groomed, clean and shiny. Thanks to the cat grooming glove, your furniture, carpets, floors and clothes won't be covered in your pet's hair as soon as you clean them! If you're a pet owner, this pet deshedding glove is guaranteed to make your life tidier and easier! 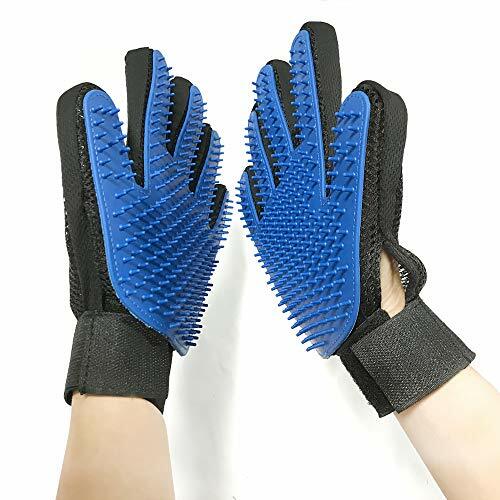 GLOVE COVERED WITH 259 SILICONE TIPS: The palm and fingers of these flexible pet hair remover gloves are covered with 259 silicone tips that will brush your pet's fur and massage its skin, distributing all the natural oils. These tips are nontoxic, soft and smooth, so they are absolutely safe for your adorable pet. You can trust us, your pet's safety is our top priority! SUITABLE FOR ALL BREEDS AND HAIR TYPES: The dog grooming mitt can be used on all dogs and cats breeds (or even horses and various small animals), and it will effectively remove their loose hair, whether it is long, short, curly or straight. The pet grooming mitt will also brush and untangle your pet's coat and collect all the loose hair, before it ends on your furniture and floors. COMFORTABLE ADJUSTABLE DESIGN: The CAITNAND cat deshedding glove has an adjustable wrist strap, so it will feel absolutely sturdy and comfortable around your hand. In addition, the dog deshedding glove is made with the most breathable materials, so your hand won't get sweaty while you will be grooming your pet's fur. Try the dog shedding glove out and see for yourself! BUY THE CAT SHEDDING GLOVE WITH CONFIDENCE: Here at CAITNAND we're very confident about the premium quality and practicality of our pet hair glove. We want you to feel confident, too, when making this purchase, for this reason we offer you a 100% money back guarantee. This is a completely risk-free purchase, so don't hold back any longer - place and order today! If you have any questions about this product by CAITNAND, contact us by completing and submitting the form below. If you are looking for a specif part number, please include it with your message.